"Plinking" sound will grab the attention of passersby. 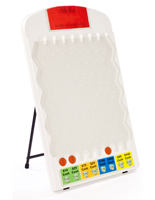 Mini size displays games at eye-level, when positioned on a table. Provided software helps to personalize every prize segment. Trade show games enhance a booth's overall appearance by providing visitors with a form of entertainment. 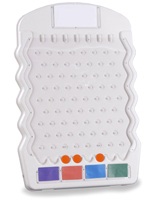 Prize drop boards are based on the popular game from American. 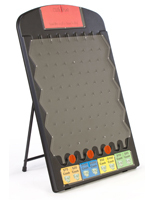 The trade show games are made up of 68 pegs with each row, of seven or eight, offset from a previous one. 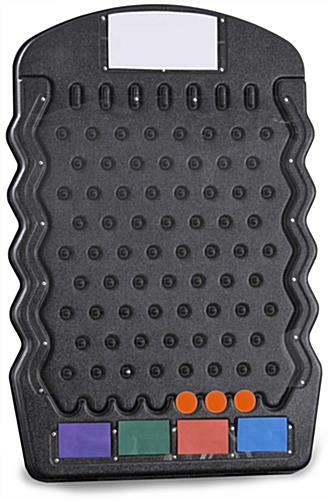 These gaming displays, as shown here, are used by dropping a round flat puck into a board. The chip will ricochet randomly against the pegs until landing at the bottom, into a prize slot. 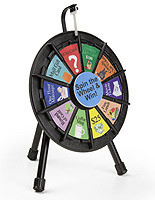 These trade show games, also known as trade show entertainment, divide the bottom into four separate slots marked for prizes. The gaming fixtures feature customizable prize sections so users can cater each exhibit to a specific product, service or industry. Simply follow the templates to create and print out each award, as well as a custom header! 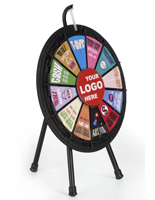 These trade show games are designed for use on a tabletop or counter. 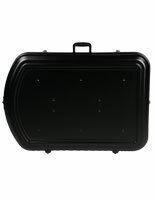 This makes the gaming boards perfect for use within a booth or on a display table. Trade show games provide visitors with entertainment, drawing more awareness towards your overall presentation. These gaming boards work in various other locations, including retail stores, schools and office settings to promote a sale or social event. 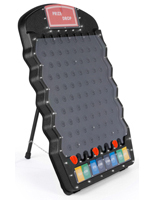 The trade show games are constructed from ABS plastic and utilize a powder-coated steel stand for added stability. The clear acrylic overlay allows participants to watch as a puck drops down into a prize slot. Each prize drop board is supplied with three white chips. 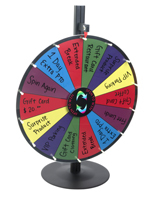 These trade show games will add an exciting element to any booth, increasing your marketing attempts' overall success by just adding entertainment!